Family traditions can be especially scrumptious. I recently pulled this delicious jewel from the worn wooden recipe box adorning the top of my mother’s inherited antique buffet. This from-scratch cake recipe has been in my family for four generations. It is a unique, one-of-a-kind dessert that has stood the test of time and remains a favorite go-to confection, perfect for spicing up a rainy day or adding something extra special to a celebration. Pour boiling water over oatmeal. Mix and let stand. Preheat the oven to 350°F. Grease and flour one 9x13 pan. Using a mixer, cream the white and brown sugar with the butter until light and fluffy. Add the eggs and vanilla, then beat the mixture. Stir in the softened oatmeal. Sift together the flour, soda and cinnamon. Add the dry ingredients into the wet ingredients and stir just until combined and the batter is even in consistency. Pour batter into pan and bake for 40 to 45 minutes, or until a toothpick inserted in the middle comes out clean. Combine the milk, butter and brown sugar in a sauce pan, warm and stir frequently until the sugar is dissolved and the mixture just comes to a boil. Then stir in the coconut flakes into the glaze. Once the cake has cooled slightly but is still nice and warm, pour the glaze over the cake and spread evenly. The glaze will soak into the cake to create a moist, creamy texture. Serve and enjoy!! « What is Coffee to you? This looks so delicious. There is really nothing better than a good recipe that has been passed down through the generations. This recipe looks so delicious and I like the name of it. I bet it is not to hard to make, and this would make a good Holiday dessert. I like trying different desserts. You’re right, Julie! It is perfect for the holidays! Hope you get to try it this year. Who knows, it may become one of your family traditions! This looks sooooo good. I have one question, though. 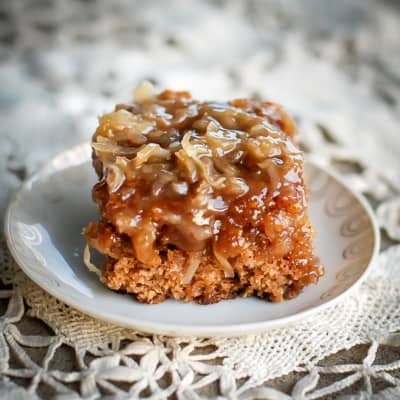 Do you use light brown sugar, or dark brown sugar? I never know which to use. I printed this recipe a few months ago and finally decided to make it tonight for my Small Group at church tomorrow. I have one question: The cake ingredients list one teaspoon of vanilla TWICE. Should the second mention of the vanilla be one teaspoon of some dry spice instead ( since it is listed as the last cake ingredient, right after the cinnamon)?